Little rippers will be taking to the trails this weekend for the the second youth riding event of the season put on by the North Shore Mountain Bike Association. This season the NSMBA has been actively trying to expand follow its motto: Trails for all, trails forever. 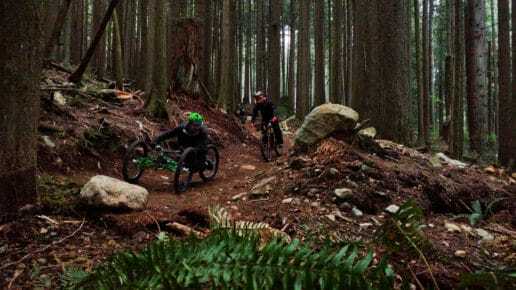 From reworking parts of the Bobsled to make it accessible to adaptive mountain bikes to its larger plans for a Seymour Mountain adaptive mountain bike loop – soon people who cannot participate in traditional two-wheel mountain biking will be able to shred the mountain on three- or four-wheeled bikes. In the same vein, the NSMBA kicked off a youth riding series in 2018. 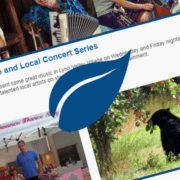 Its next event is Sunday, Sept. 23, on Mt. Fromme. The Youth Toonie Series builds on the successful Fiver series which saw adult riders gathering twice a month for some leisurely racing and community connection – often with a charity component like the $6000 raised last week for the Autism BC and the Canucks Autism Network. While the Fivers will kick off again next April, youth are invited to trails this week. While not a race, the Toonie rides are about getting kids aged 2-13+ out on the trails and celebrating the riding community. Run bikes can take on Roadside Attraction, while pedalers challenge that trail too, the Griffens or Boblsed. The first event earlier this year had over 100 kids take to the trails. The NSMBA knew families wanted this. The organization heard from parents whose children had done other events in places like Squamish. “If parents love riding, kids love riding,” said Pugh. 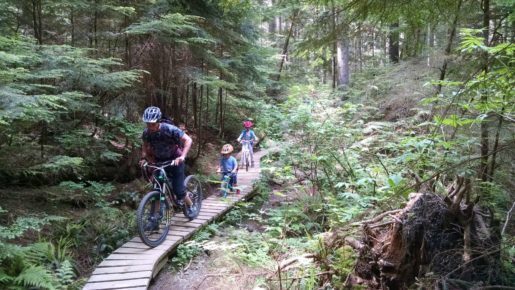 Grab a toonie, your helmet and bike and meet up at Mount Fromme Sept. 23 from 10 a.m. – 2 p.m. Ride registration is from 10 a.m.-12 p.m. Bring gloves, armour and a backpack if you have it – but it’s not necessary. There will be treats and games for participants. Full details on Facebook or here, and participants are asked to register so the NSMBA can plan for all participants. While the Endless Biking is helping out with the event, the NSMBA would love some volunteers. If you love mountain biking and what to get even more involved the NSMBA is hosting the Western Mountain Bike Advocacy Symposium Oct. 12-14 focusing on Building a Diverse Mountain Bike Community. It will also build on the NSMBA’s motto and guiding principle of Trails for all, trails forever. Presentations and discussions will include: Privilege and the Mountain Bike Community, Building First Nations Relationships, Adaptive Mountain Biking, Supporting Youth Voices, and Reducing Barriers to Participation. More information can be found here.